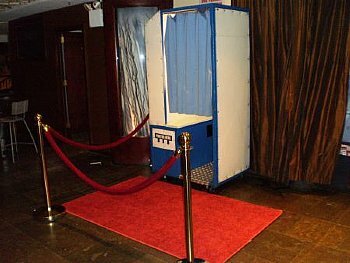 A photo booth rental with red carpet, red velvet ropes and brass stanchions. Options to choose different color carpets and ropes. 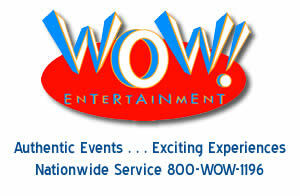 Contact a WOW Entertainment event specialist at 800-969-1196 or 732-846-8300 to discuss the color options available. 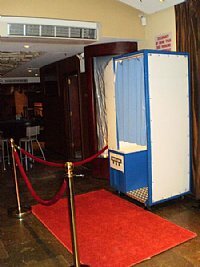 This photo booth rental can be combined with other services including the picture service which permits 60 pictures placed around the exterior of the photo booth to provide a collage of the guest/guests of honor as well as the having the entire or parts of the photo booth wrapped. Photo strips are printed out in either black & white or color. Each guest or guests make their own choice while participating. CD service where the guest/guests of honor receive a CD with all of the photos taken during the photo booth rental. Other features include for this photo booth rental are props, photo strip holders and plasma screens placed around the photo booth displaying the activities behind the curtain of the photo booth. The VIP Photo Booth Rental grew out one of our event clients desire to have the feel of a movie premier at her event. 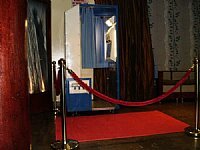 Since the photo booth rental would be taking place at the established nightclub location Branch in New York City, our event specialists came up with the idea to position red carpet along with red velvet rope and brass stanchions immediately in front of the photo booth. The effect that this created added the elegant pizazz that this particular event client was seeking and created additional excitement at the nightclub. The VIP Photo Booth rental can be customized with several different color options. Clients can choose from different color carpets as well as different color ropes to create a matching color scheme. A sweet 16 client with a pink theme can have pink carpet, black velvet ropes and choose the sweet 16 photo booth rental for their event. A wedding client can have a white carpet, white or black velvet ropes and combine these choices with a photo booth rental with pictures. Our recommendation is to contact one of our event specialists at 800-969-1196 or 732-846-8300 to discuss the color possibilities.